In 2002, the idea of the GoPro cameras came to be. This took place in Australia, just after the owner went on a surfing trip. He realized that there was a lack in proper cameras that catered to surfing. This applied to other watersports as well, where the videos either looked low quality or were taken from too far away. 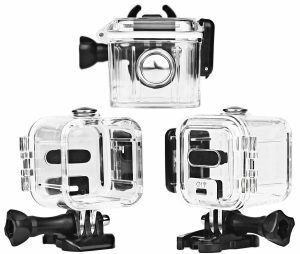 The fact that you want the best GoPro waterproof case means that you already have some knowledge about the camera. You won’t leave this review empty-handed, whether you want one for personal use, or for someone else. It makes sense for you to want to protect your camera. After all, you spent money on it and for some, their GoPro cameras are how they earn a living. There are essential equipment that one needs to have, once you own a GoPro camera. The best GoPro waterproof cases are part of those must-have accessories. They will enable you to fully utilize your camera, and will help you reach your potential when it comes to this field. You need to be aware of what you can achieve, once you start engaging yourself in underwater photography and videography. The Light Transmittance of The Waterproof Case: This is important because the percentage of the light transmittance will affect the quality. If the transmittance is low, the video quality will be low as well. Indirect exposure of the lens is what leads to this. However, the quality will be very high if the light transmittance is equally high. At 95-98% the quality you get will make it seem as if there is no case present. The Type of GoPro Camera You Own: Before making any purchases, you should ensure that the case is compatible with your camera. Always check the specifications, to make sure that you get the right GoPro waterproof case. Otherwise, you may end up with a case that you can’t even use. The Depth Waterproof Case Can Handle: We all have different uses for our GoPro cameras. The depth becomes an issue, for people who seek to take on extreme activities. Someone who wants to snorkel and one, who wishes to go deep sea diving, will need different depth requirements. Make sure you are aware of the activities that you will be planning to take on. This way, you can choose the waterproof case depth that will be suitable for you. The Design of The Case: You need a case that will not frustrate you, once you get in the water. That is why you need to settle for an easy to use design. It should be simple to operate so that your attention is not divided. 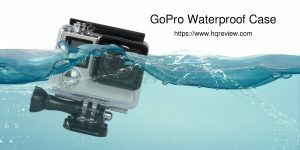 They Are Of The Best Quality: Unlike other common cases, GoPro waterproof cases are of higher quality. 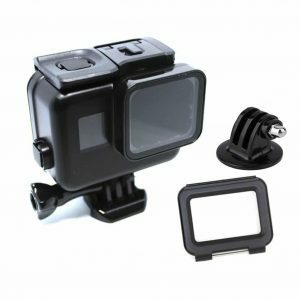 Since they have been custom made for your exact Hero version, they will help to fully maximize your GoPro experience. These cases last longer and have excellent performance. The Case Will Protect Your Camera: Your camera will be fully protected, whenever it’s exposed to water. This means that you won’t have to worry that it will incur any damages. Having the best waterproof case will ensure that you don’t spend money on camera replacements. 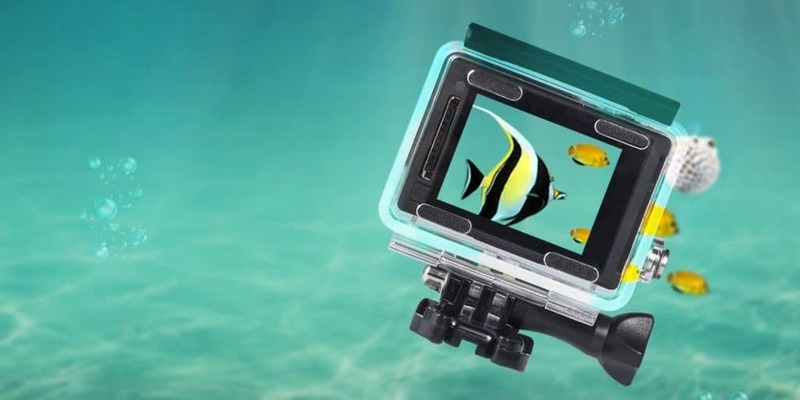 You Will Be Able To Take Excellent Shots: When it comes to water-sports and other up close underwater needs, GoPro cameras are the only ones which can deliver. Having a case will ensure that you can get magnificent photos, without risking your camera. A waterproof case will add versatility to your work. FiTSTILL has the best option for individuals who own, GoPro Hero Session action and GoPro Hero 5 Session. This GoPro waterproof case works marvelously both out of and in the water. The entire housing is constructed to withstand deep sea diving. If you wish to take on other extreme water activities, you can still use this case. The company offers a lifetime warranty and readily available customer support. Compared to other waterproof cases, this particular one can be used 6 times deeper under water. It is waterproof up to 60 meters/ 196 feet underwater. The case can be used with GoPro session, hero 4session or hero5 session cameras. Not only will your camera be shielded from water, But also will be protected from scratches, dust and shocks as well. The quality of your photos and videos will remain exquisite despite anti-surf pressure. All your shots will be clear and vivid. 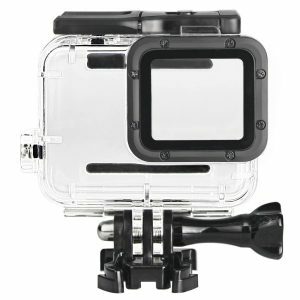 The GoPro waterproof case has been designed in a way that other accessories can be mounted on it. This is what makes this case very convenient. It can withstand usage up to 45m deep. 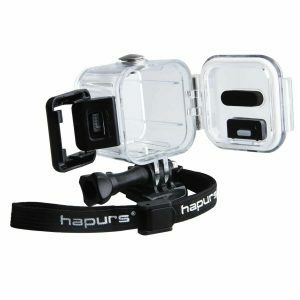 Hapurs offers a slim and lightweight, GoPro waterproof case. It has been designed for easy wear-ability and will not cause you any trouble underwater. The case is resistant to cold environments, and can even be used on a snowy day. 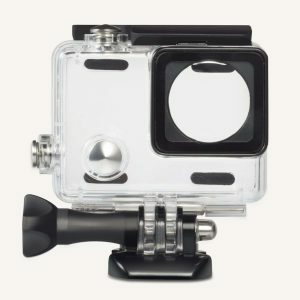 It is recommended for the latest Gopro Hero 4 Session and 5 Session sports cameras. 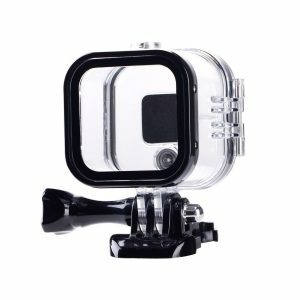 The purchase includes; a Waterproof housing cover, a Screw, a Quick Release, a Hapurs Strap and a Cleaning Cloth. Deyard constructed a GoPro waterproof case, which has a high strength shell. The case has been designed with a seal which is waterproof and a tight buckle as well. The lens area is made of tempered glass. This in turn makes sure that your GoPro lens, will not be prone to scratching. The waterproof case has high transmittance. Because of this, all the pictures you take will be of great quality and high definition as well. I would recommend this for people who own GoPro Hero6 and Hero5 Black cameras. The waterproof case is one of the most durable ones in the market. It was constructed with high-strength plastic, for that purpose. Your purchase will include anti-fog inserts. Inserting them reduces the chances of moisture or condensation forming inside of the case. You won’t experience any fog build-up at all. For a full sealed effect, there is a rubber ring around the case housing. This enhances your camera’s waterproof protection. You can use the case while surfing, snorkeling, scuba, cliff diving, wakeboarding or any other action sport. 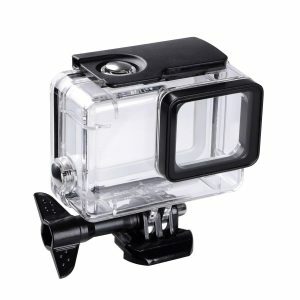 When you buy this GoPro waterproof case, you will also get a quick pull movable socket and a screw. You will also get a free lens cover, as a bonus with this purchase. The waterproof case has been designed to deliver maximum image sharpness. Its lens is large and flat, to ensure that it can work effectively whether inside or outside the water. You will also get an underwater dive case shell. The great thing is that the shell also includes bracket accessories as well. Soonsun offers the perfect replacement solution. 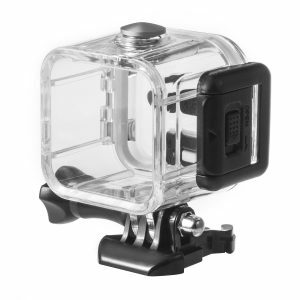 This GoPro waterproof case, comes with a lock buckle and a lens cap cover. CNC Aluminum was used to construct the lens frame, while high-quality plastic was used for the housing. Your camera will be in great hands since the case has a very strong structure. You will be impressed by the craftsmanship behind the camera case. It has been made such that it is easy to install and operate. This particular case is referred to as the GoPro super suite upgrade. Your camera will perfectly fit, even without you removing the GoPro 5 lens. 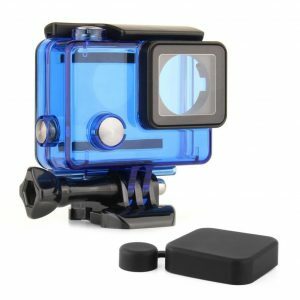 It is definitely worth buying, since it all GoPro hero 5 super suit housing accessories can fit in it. The case has an internal switch button and can reduce the GoPro button’s pressure. This ensures that the button is well protected. For a waterproof shell lens, high-quality acrylic material was used. The acrylic was also used for AF, AR double-layer optical coating. 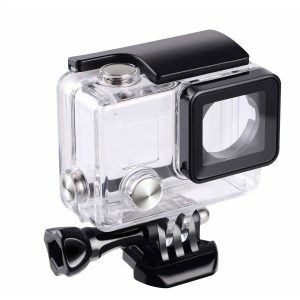 Suptig caters to GoPro HERO4, HERO3+ and HERO3 owners. The company used stainless steel, to ensure that the case was durable and rust resistant. The toughened glass around the front has a 98% light transmittance rate. You are guaranteed that the pictures you take will be beautiful. Operating the select key, mode button, the shutter and the power button will be very easy. The case measures approximately; 7.0cm (L) x4.3cm (W) x7.5cm (H). This GoPro waterproof case comes with a 24-month warranty. You will also get a 30 days money back guarantee. Anyone who values photography and videography can own a GoPro camera. It doesn’t matter whether you are a professional or not. The top 10 best waterproof cases displayed on this list, will make sure that you enjoy doing what you love to the fullest. The best waterproof cases are also available at different prices, so you can’t miss one in case you’re on a budget.